Want to WIN TICKETS to Uni Revue 2017: Make Tasmania Great Again? All you have to do is help Uni Revue be great again by filling out a short survey that asks what YOU like and dislike about our 70 year old institution. It only takes a few minutes to do, and the results will … Read moreUni Revue: Do Survey, Win Tickets! 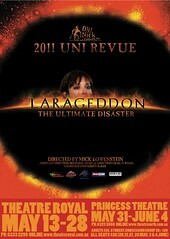 Hey guys, it’s me, the Uni Revue! Check out my new cast! The first thing I did was get people to sign their names on it. So all the people who have their names on Uni Revue’s awesome cast are: David Abbott Beck Andrews Luke Andrews Kristy Baker Angela Barnard Elyse Barnes Naarah … Read moreCheck out my awesome cast!